Managed to sleep a bit longer this morning, woke at 4am. DD woke around 5am and DH at 5.30am. 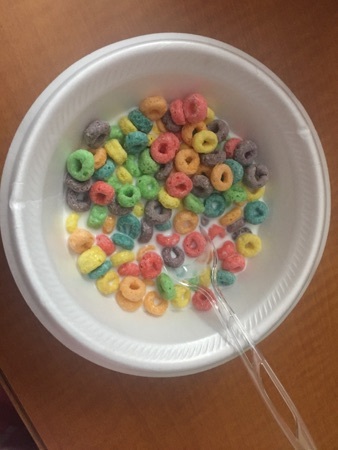 DD had some fruit loops for breakfast, I don't know how anyone eats these, they smell horrific but DD enjoyed them. e set off for Epcot at 8.20 and arrived in the car park 10 minutes later, bag check was manic this morning, took about 20 minutes to get through. The queues for the tapstiles were so long too, at least 30 people in each one, the annual pass queue was completely empty which was fab. 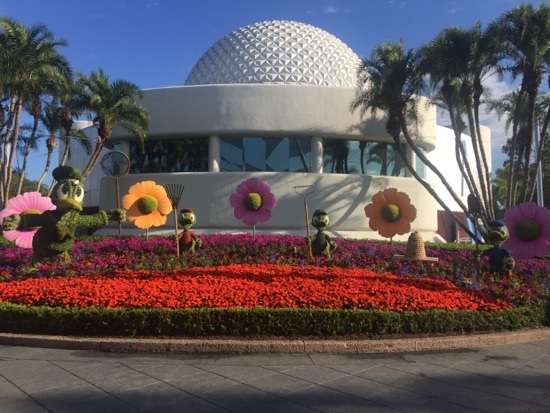 Dd and DH went on spaceship earth which was a walk on while I walked round admiring some of the topiaries in future world. 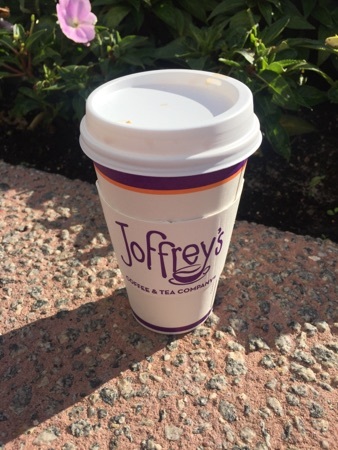 On the way back to meet Dd and DH I grabbed a Joffrey's coffee for DH, the coffee must have changed as it wasn't like last time we got one and DH didn't really enjoy it. He offered me it to try but his comparison of it to dish water wasn't exactly selling it to me. We left around 11.30 and decided we'd grab some lunch on the way back to the hotel, I drove (!) 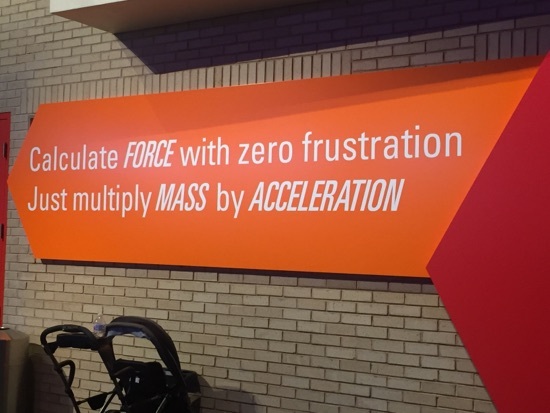 us to Arby's on the 192. I love the saver menu here, I picked a roast beef slider and a ham slider, both of these had cheese in and were $1.29 each. I also got a small portion of curly fries to go with them for $1.79. 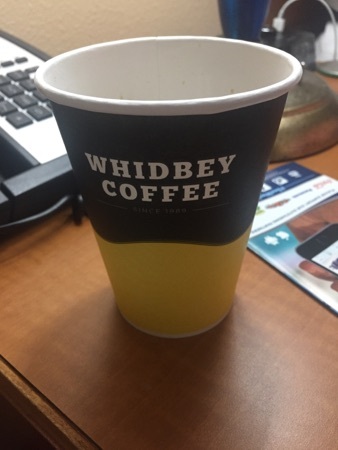 The roast beef slider was my favourite, there was plenty of filling in them and Arby's do a selection of 5 different self serve sauces which went really well with both sliders, especially the honey mustard one, but I do love honey mustard. DH had a large roast beef sandwich meal and polished this off in no time which usually means it was good. 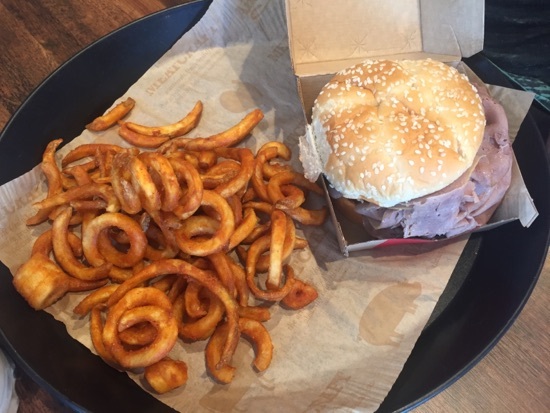 Arby's is a favourite of DH's and I spent a long time not particularly liking it but I've totally changed my opinion now. 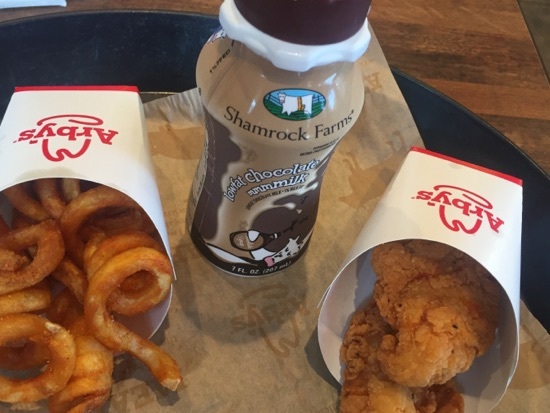 Dd had the kids chicken tenders meal with curly fries and a chocolate milk for $3.99. The chicken tenders are really good and this was a decent sized kids meal. DH and I both got an ultimate chocolate milkshake, I got a small and he got a large. The small one was big enough but the large one was massive! These are absolutely delicious, made with ice cream and topped with whipped cream and ghirardelli chocolate sauce. I then spent the next hour wishing I hadn't finished it all, really sickly but really good! 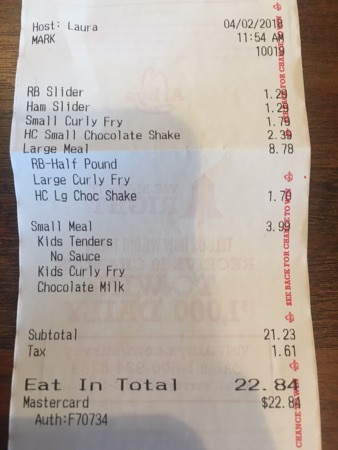 Total lunch came to $22.84, absolute bargain when you compare it to Buffalo Wild Wings last night. After a short rest back at our hotel we drove to blizzard beach for an afternoon of water park fun. Dd has just learned to swim properly so is loving waterparks/pools at the moment. 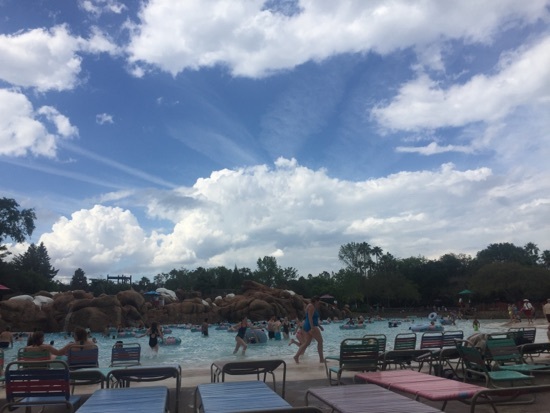 It clouded over around lunch time so the afternoon was a pleasant temperature and perfect water park weather, no danger of getting burnt to a crisp. When we got there we hired a towel each and the cast member sprinkled some pixie dust and didn't charge us for them which was awfully nice of her. Blizzard beach was relatively quiet, none of the slides had a wait longer than 15 minutes and by 3 o'clock there were plenty of loungers available. We went back to the hotel, showered and changed and settled on spending the evening shopping at the outlets at Vineland. First stop was the food court for some dinner. DH and I both decided on the Chinese counter. 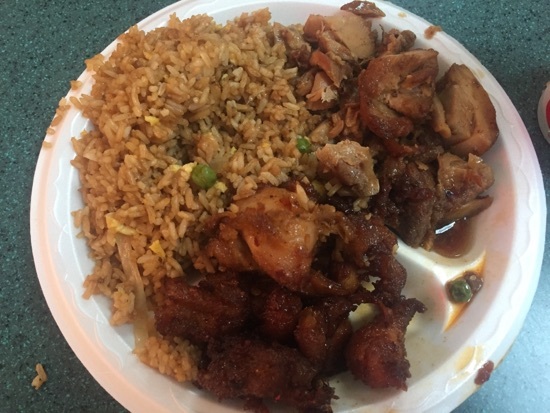 I had the bourbon chicken and Mongolian chicken with fried rice, I shared with DD who wasn't particularly hungry. This was delicious particularly the Mongolian chicken, it was quite spicy but really tasty and quite hard when you bite into it which I love. This was $8.99 and there was a huge plateful, DH and I had both started eating before I remembered to take a picture. 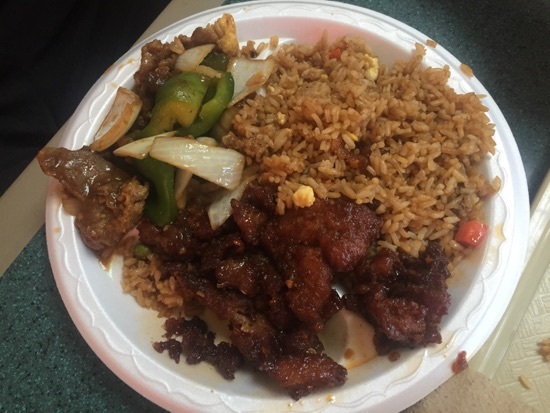 DH had the Mongolian chicken and peppered steak with fried rice. He really enjoyed this and thought the Mongolian chicken was really good, he even finished off what I didn't manage of mine. 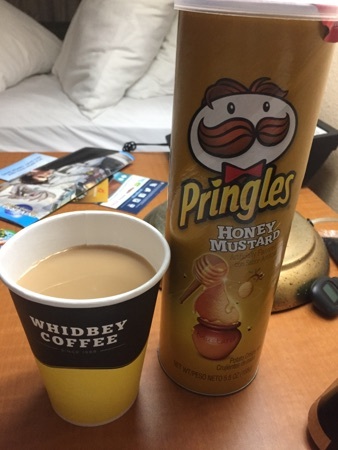 This came to $24.14 with a soft drink. I certainly feel like we would eat perfectly well if we were sticking to a budget. 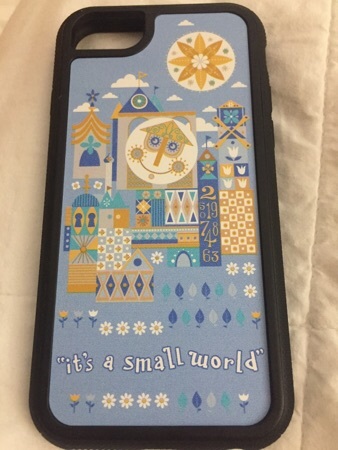 After dinner we hit the character warehouse where we got a few bits and pieces, I bought a small world phone cover for $7.99, a Walt Disney world t shirt also for $7.99 and got DD a t shirt and a Minnie Mouse hoodie. DH bought some Star Wars stuff and a run disney Christmas ornament with 2017 which is the year he took part in the Star Wars run weekend so it had to be bought! After a few more shops it started to pour down so we decided to call it a night and head back to the hotel. Sounds like a great day with a good mix of stuff done and some tasty food. Woah, the queue for Soarin' was crazy for so early in the morning. 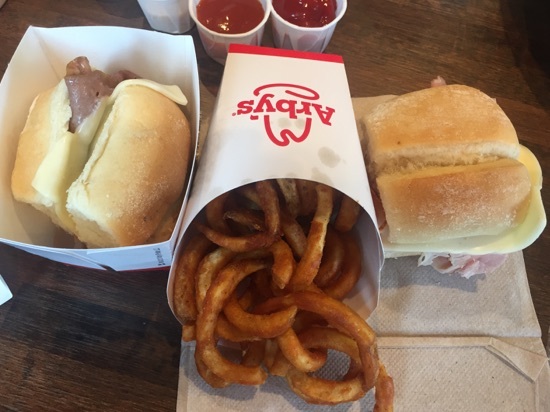 I have never tried Arby's but your DH sandwich looks really good. Gotta love some food court Chinese too! when can we go back? New Photo Added by missdopey - 4 Apr 18 1:39 AM. I've never heard of Arby's but it looked good for what it is. Got some good bargains from the character warehouse. 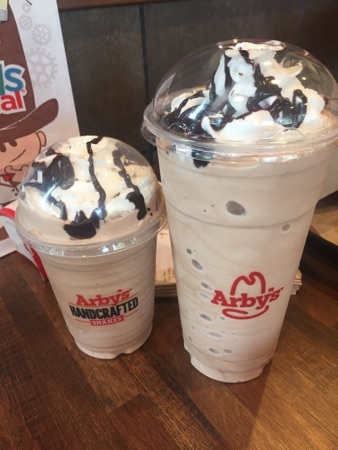 Another one who's not heard of Arbys before - that milkshake was definitely massive! I bet it was nice to escape the crowds at Blizzard Beach! Nice to end the day with a spot of shopping - I love your phone case.